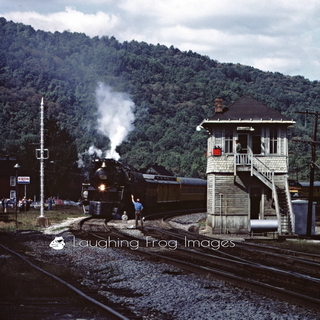 On September 27, 1980 C&O 614 powered a public passenger excursion from B&O’s Grant Street Station in Pittsburgh, PA to Rockwood, PA and return via the mainline of the Baltimore and Ohio Railroad. As I recall, a seat in an open window coach car was about $36, cinders included! It was steam! I was able to borrow the car (a 1978 Volkswagen Dasher station wagon with a 4-speed manual that did a fantastic job in the hills along the B&O), and I was the chauffeur for friends from New York and Ohio. This was a Saturday trip – Sunday would bring a trip over the Wheeling Pike to New Martinsville, WV. Of course, there was a Vinnie Pie to be had in between (that’s another post in itself). Quite the weekend indeed! This excursion was part of the Chessie System’s Safety Express trips, and the cars were staffed by volunteers from the Pittsburgh Chapter of the National Railway Historical Society and the Pittsburgh Transportation Museum Society. 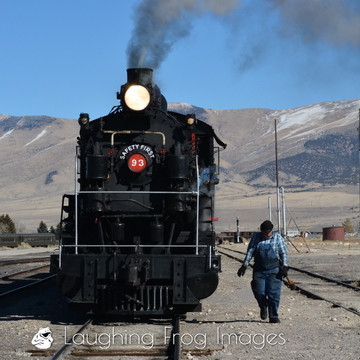 In a couple of years, I was no longer photographing many of these trips as I was working on the train as a volunteer. Being a steam engine and all, I also created some black and white images in Perfect Photo Suite that emulate the profile of Kodak Panatomic X film. Some folks prefer their steam in black and white, so I’m trying to accommodate those folks as well. 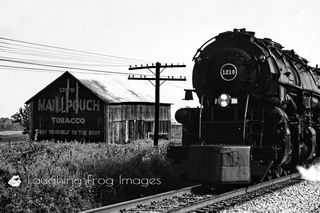 And, some images of steam are simply timeless in black and white. That said, I couldn’t resist removing the Exxon sign from one of the images at CF Tower… I’m not one to modify images beyond exposure and color corrections – but I simply couldn’t resist in this case. The tower with its’ shingle siding spoke of an earlier time. The steam engine spoke of an earlier time. And that Exxon sign – yes, it gave a time perspective to the picture, but it also was just begging to be removed for a view of what things were once like in the Allegheny and Appalachian Mountains. C&O 614 never operated here in regular service – she stayed on the Chesapeake and Ohio rails to the south – but it’s the scene that allows one to drift back in time. For some it’s a memory, and for others it’s a state of imaging what it would have been like to grow up with steam engines. If you look closely, you’ll see that the series at CF Tower almost weren’t – look at where the cloud shadow is! We were sweating it out, and every possible finger and appendage was crossed as we heard the 614 whistling her way east through the Narrows. As she got closer, we could hear her working against the grade. And we looked at the cloud. And the sun. And the shadow. You may notice that I didn’t crop all of the images – I left them as scanned so that you can determine the most appropriate crop for what you’d like to do with the image. I don’t want to be “the decider” of how you get to enjoy an image. You can crop the image however you want to make it yours on the product you want – and through December 15, you can do that for 25% off! On a somber note, CF Tower was destroyed in a derailment in 1987 that also killed the Operator. I watched many a train from that tower… RIP Mr. Leonberger. If you’d like to learn more about C&O 614, click here www.co614.com. Yes, she has her own website. Thank you Ross Rowland!